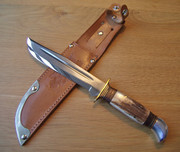 Vintage P.Holmberg hunting knife, made in the Swedish city of Eskilstuna. Pontus Holmberg (1852 – 1893) started his factory in 1876 (Aktiebolaget Pontus Holmberg). When Pontus died in 1893, the company was first operated by Pontus’ brother Fritiof Holmberg (1860 – 1911) and later by Fritiof’s sons Fritiof Ragnar (1889 – 1916) and Fritiof Ruben (1893 – 1952). In 1951, the company was sold to Heljestrands industries, and the company produced barrel knives at least until 1954. The company closed its doors in the early 1960's. Sheath: leather with folded steel point protector and original red leather "button lip". Last edited by kwackster on Thu Feb 21, 2019 9:41 am, edited 1 time in total. Very impressive hunting life. It’s in near perfect condition; an excellent addition to your collection. Thank you for the information about the knife company. These knives are highly sought after by people due to their high quality carbon steel ,I know because I am one of those people . I have a Frosts mora from Sweden that i love ,it badly needs sharpening by an expert like yourself ....but I will wager that Eskilstuna takes a fine edge and retains it well. Thanks for sharing this as I never can get hold of them and if I do see them they are heavily used and never that clean in condition....you have found a beauty.mate. As the original edge of the knife was rather blunt i gave it a new one, after grinding the old apex flat on the Tormek by using a combination of Rubber Wheels coated with diamond grit to create the new bevels & various Paper Wheels with fine diamond compounds for the finishing steps. Now photographing shiny metal to resemble accurately what it looks like in real life will always remain difficult (especially with a cheap camera like mine), and this edge is no exception: what at first glance may look like a polished edge is in effect just a polished toothy edge, but one that is easily hairwhittling sharp yet has noticeably more bite than expected. The new edge is ever so slightly convex and it's apex fits in the 30 degrees inclusive slot of my Tormek WM200 angle guide.